Fruit and vegan yogurt parfait is so simple that it’s almost not a recipe at all, as welcome for breakfast as it is for dessert. Layering nondairy yogurts with seasonal fruits takes almost no effort, creating a treat that looks as appealing as it tastes. It’s a real pleaser, as welcome for breakfast as well as desserts, and a good way to get kids (or the generally finicky) to eat more fruit. Layering nondairy yogurts with seasonal fruits takes almost no effort, creating a treat that looks as appealing as it tastes. Use 4 parfait dishes if you have them; if not, medium-sized glass tumblers will do. 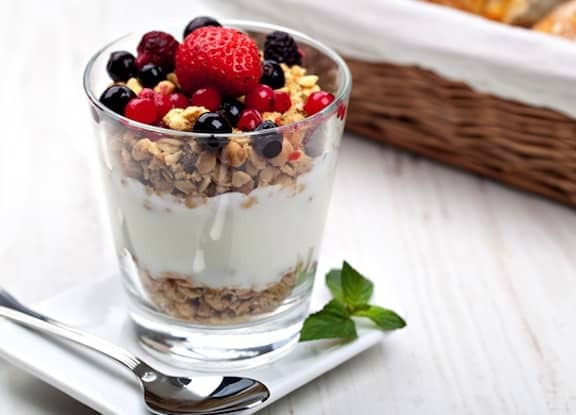 For each serving, layer ¼ cup each of yogurt and fruit in the parfait dish. Repeat each layer, then do the same for the other parfaits. Sprinkle with the topping of choice, and serve. For four parfaits, you can generally figure on using 2 cups of fruit. Try the following combinations or come up with your own. Strawberries: Remove the hulls from 1 pint of very sweet, ripe strawberries and slice them. Strawberries and blueberries: Combine 1 cup of strawberries, hulled and sliced, with 1 cup fresh blueberries. Peaches or nectarines with berries: Combine 1 cup diced ripe peach or nectarine, with 1 cup of berries. Mango and berries or banana: Combine 1 cup diced mango with 1 cup blueberries, raspberries, or sliced strawberries, or 1 cup thinly sliced banana. Very cool maybe want to make this!! Sounds good. 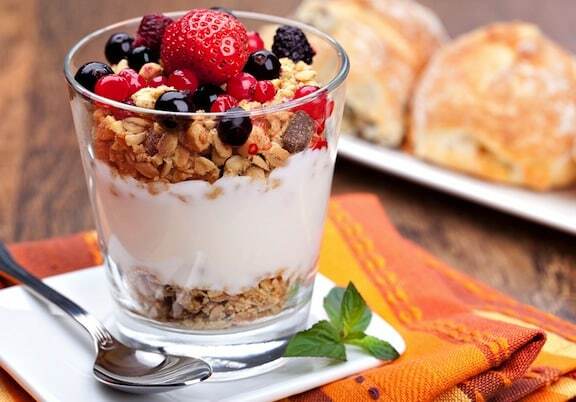 great parfait. I’ve tried with vanilla yogurt and it’s awesome. thanks. This isn’t a recipe you’re just combining pre made stuff.